A tap left running as a piece of art at a south London gallery has infuriated Thames Water, which is considering legal action to switch it off. Artist Mark McGowan said he intends to leave it running for a year at the House Gallery in Camberwell as a comment on how much water we all waste. Thames Water said it is a "flagrant waste" after such a dry spell. But Mr McGowan said the company itself wasted millions of litres of water through leaks, adding: "Mine's art". The Running Tap was switched on, on Tuesday, at the House Gallery in Camberwell and has already been switched off twice by visitors who did not want to see the water wasted. Thames Water spokesman Nick Tennant told BBC News: "We think it is irresponsible and counter productive. "We have gone through one of the driest winters on record and are in the eighth successive month of below-average rainfall. "We think we have grounds to take legal action and do intend to do so if we can." Londoners use more water than the national average, prompting calls this week from mayor Ken Livingstone to residents to conserve more water. But Mr McGowan said the mayor should have told Thames Water to fix London's leaking Victorian water mains. 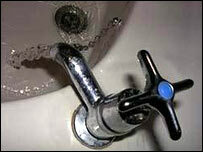 The London Assembly said nearly 1,000m litres of water were lost in the region in 2003/04. 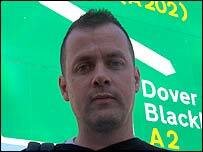 "We are all culpable, we all waste water and that includes Thames Water," Mr McGowan said. But Thames Water said it is in the process of replacing 850 miles of Victorian water mains in London, but says the environment is everyone's responsibility. "We are appealing to his better judgement, that now he has made his point - to turn it off," Mr Tennant added. Previous stunts by Mr McGowan include rolling a monkey nut with his nose to Downing Street to protest against student debt and sitting in a bath of baked beans for 12 days to celebrate English food.